Downtown Tucson’s Cushing Street runs between Stone and Granada Avenues. Back in the early 1870s when the street was named, Tucson could boast of having a population of around 3,200. Cushing Street was named in honor of Lieutenant Howard B. Cushing who was killed on May 5, 1871 in a furious fight with the Apaches in the mountains about 35 miles south of Tucson and north of present Ft. Huachuca. At the time of his death at the age of 32, Lt. Cushing had gained a reputation as one of the most famous Indian fighters in the southwest during the years following the Civil War. He was perhaps the most well-known Indian fighter of his time in the Arizona Territory. Howard Cushing served in the Union Army artillery throughout the Civil War. He enlisted as a private and later earned a commission as a second lieutenant. During the deadly conflict, Lt. Cushing was involved in 20 battles, never losing a gun or being driven from a position. About six months after the end of the Civil War, Cushing was involved in a drunken brawl. In the court martial proceedings that followed the incident, he was suspended from rank and pay for one year. 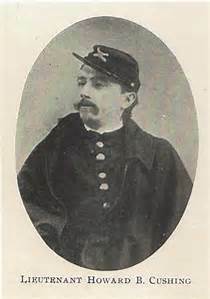 When he returned to active service in 1867 as a first lieutenant, Howard Cushing became the officer in charge of Troop F of the 3rd U.S. Cavalry. 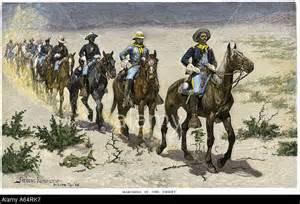 For a time, his unit was stationed in west Texas and the New Mexico Territory before moving to the Arizona Territory. It has been said that Cushing and his troopers killed more Apaches than any other officer or cavalry troop in the U.S. Army. On his fatal mission, Cushing was pursuing a band of Chiricahua Apaches that were heading for the Mexican border. His unit was caught in an ambush, Lt. Cushing and seven others were killed in the fight. Cushing’s death was announced by the army in a statement that read in part “while gallantly leading his command in an attack against a band of Indians.” Other accounts of the day reported that he was “One of the best and bravest officers.” “Arizona lost one of her most worthy defenders.” “At this critical time she could ill afford to part with.” Lt. Cushing was buried at Ft. Lowell and later reinterred at the San Francisco National Cemetery when Ft. Lowell was closed. In The Civil War, a time of great national upheaval and conflict, Cushing’s two brothers also won lasting military fame. Alonzo, a Union artillery officer, was killed in action during the repulse of Pickett’s Charge on the third day of the battle of Gettysburg. Another brother, William, was a naval officer. 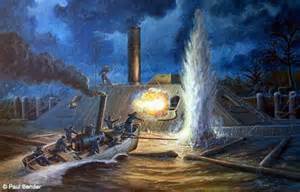 One of his most noteworthy wartime exploits occurred when he led the audacious small boat raid up the Roanoke River that disabled the CSS Albemarle. He would go on to become the youngest full commander in the U.S. Navy.